Welcome to the New Generation of Medical Identification. Having an EndlessID gives people the peace of mind to know that no matter where they are or what they are doing, if something happens, the right information will get to the right people immediately and their loved ones will be notified instantly. Imagine an exhilarating hike on a beautiful sunny day, and a careless slip causes a fall off a cliff. It was a lapse of judgement, they walked too close to the edge and slid 20 feet down the side of a mountain. Luck is on the persons side and a group of hikers find them unconscious on the trail, but when they get to the hospital doctors want to give them medicine they're allergic to. Have you thought about what you could do in that situation? Gustavo Rubacha has, and his new product EndlessID could save ones life. With a background in software engineering and consumer product development, Rubacha was inspired by his own medical emergency and the emergence of wearables and portable data storage. He believes the technology could be applied to more practical and lifesaving situations. “With today’s technology, one can get all kinds of frivolous information with just a few finger swipes, but it’s not always easy to get to the data that we actually need at any given time.” Rubacha said. “In an emergency situation, one doesn’t have any time to spare, and that’s why I created EndlessID." EndlessID acts as a digital ‘key’ to instantly access your medical information and emergency contact, available in a bracelet or an electronic card that can fit in a wallet. While other products give access to a patient’s medical history through cumbersome web site logins - wasting precious time – EndlessID delivers critical information to first responders with just the tap of a mobile device using the same near-field communication technology (NFC) as tap-and-go services like Apple Pay and Google Wallet. 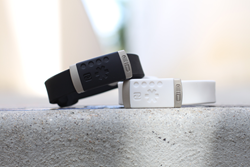 EndlessID is a fashionable, while highly functional, alternative to the traditional medical bracelets used by the elderly and people with pre-existing medical conditions. In its sleek and durable design, Rubacha packed in features to entice customers outside of this traditional market. Along with being easier to update than an engraved bracelet, EndlessID also alerts emergency contacts the moment the device is activated. When someone with EndlessID is taken to the hospital and their bracelet or card is read, their contacts receive a geolocation by email and text message, as well as a phone call notification, enabling them to respond immediately. EndlessID is HIPPA compliant and when not in use, all the information contained is encrypted and safely secured online, and does not share information with third parties. The stylish device not only keeps you and your loved ones safe, it also helps our brothers and sisters across our globe. A portion of every EndlessID purchase is donated to organizations that support human services. Product features include: Easy three step online activation process, online profile that can be updated as often as the user would like and can include details such as a profile photo, special needs, medical conditions, medications, allergies and medical insurance information. Near Field Communication (NFC) technology, simple tap access, unique id and pin number engraved in the back for web access, instant alert system upon access, notification via email, text and phone call, geo-location notification, battery-free and water resistant. The bands come in black and white with or without Swarovski crystals.